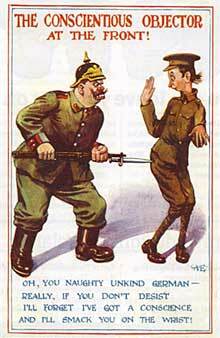 After the passing of the Military Service Act in early 1916, it was decided to form a Non-Combatant Corps of conscientious objectors. Set up in March 1916, eight Non-Combatant Corps (NCC) companies existed by the middle of June 1916. They were part of the army and run by its regular officers and non-commissioned officers, and NCC units were usually comprised of about 100 men. Over the course of the war 34 NCC companies were formed. There was no formal overarching organisation and they largely served under the command of regimental and reserve battalions. The Lewisham Military Services Tribunal initially believed that the only option open to them under the terms of the Military Services Act was to offer conscientious objectors a non-combatant certificate and they expected it to be accepted. Almost one-third of Lewisham and Deptford men appearing before its Military Service Tribunals accepted conscription into the Non-Combatant Corps, many like Frank Griffin Stone with great reluctance. From the details given in Cyril Pearce's data base, thirty-two of these men spent the war assigned to Eastern and Southern Commands of the Corps working on the 'Home Front' and six served in France, including Samuel Lang and Frank Rockingham, a dissenting minister of religion, who had been forced to accept a Non-combatant Certificate. Conscientious Objectors assigned to the NCC were enlisted as army privates and subject to army discipline, but they didn't carry weapons or take part in battle. Their duties were mainly to provide physical labour in support of the military such as work on roads, timber work, quarrying, sanitary duties, and the handling of supplies, but excluded anything that directly helped the war effort such as loading and unloading munitions. They wore army uniform and had a cap badge, and initially they received the same wage as private soldiers, but they could never be promoted and were refused the pay rise given at the end of the war to stop dissent in the ranks because of delays in demobilisation. The Military Service records of NCC men are full of large and small acts of resistance, a refusal to compromise their principles by moving munitions, weapons, or even components that might have been made into weapons. 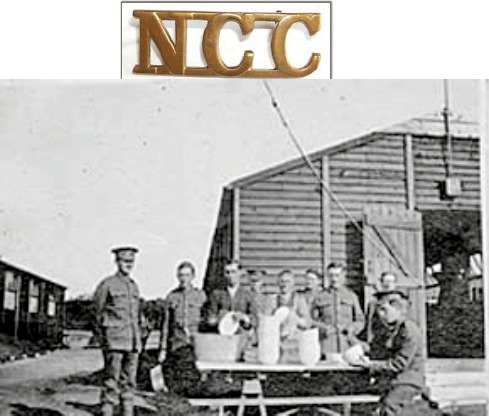 They were after all conscientious objectors, and Newhaven in particular saw the arrest of many NCC men who refused these specific orders and spent time under armed guard or confined to camp. The Deptford CO, Henry Rivett Albrow gives an account of mutinies in Newhaven and other acts of disobedience; his memoir can be found in the Imperial War Museum. While in Weymouth with the 5th Southern Coy. ; Arthur Edwin Raitt was particularly harshly treated for minor offences by being sentenced to 14 days Field Punishment No. 2; and Harry Yeates was court martialled and sentenced to hard labour in Lewes prison for refusing to work on the Sabbath, while with the 4th Southern Coy. By August 1918, around 3,500 men were willingly part of the NCC. Soldiers in the NCC had co-operated with the authorities' concept of the behaviour expected from a CO, but after the Armistice they were not considered a priority for demobilisation, were denied the pay rise given other soldiers while waiting to be returned home, and were among the last to be released. Norman Knappett, an Exclusive Plymouth Brethren, was conscripted in December 1916, spent the war in the Agricultural Corps, and was finally released on 7 January, 1920. Biographies have the tag "NCC" added. This tag lists all those from Lewisham and Deptford who served in the NCC and can be accessed by clicking on "Tags" in the navigation bar on the left. 1. South London Press, Friday March 17, 1916 page 5. 2. Henry Rivett Albrow's memoir contents description Imperial War Museum collections. Jo Vellacott, Conscientious Objection:Bertrand Russell and the Pacifists in the First World War, Spokesman Books London, 2015 edition. Image taken from Peace Pledge Union's history of the NCC and reproduced with their permission. Postcard image also taken from the PPU website.